WorldCon / LoneStarCon starts today. I won't be going down until tomorrow afternoon, unfortunately, but I'm very excited. A little nervous, as this is my first "big" con, but I think it's important to keep stepping things up. I made myself a little pledge a few years ago to keep doing new things-- convention and career-wise-- that scare me a little. Two years ago that was being on panels and a Writers' Workshop teacher at ArmadilloCon. Last year it was giving a reading. This year, I think WorldCon, in and of itself, is sufficient. Even though I've mentioned it before, it bears repeating that I am immensely pleased to be included in Rayguns. From what I've seen of the preview excerpts, everything in it is great. Furthermore, with Rayguns now released, I believe my eligibility for the Campbell Award starts today. If I'm wrong about that, someone let me know. In other news, I've now sent a polished draft of Way of the Shield to my esteemed agent. I've also updated the excerpt over on my webpage, so go and check that out. This novel was particularly challenging to write, certainly more so than the other three books set in Maradaine. It definitely was the one where the original outline survived the least in the writing process. My original concept was more of a mystery/thriller, with a plot involving figuring out who was killing members of Parliament. That didn't really fit the themes I was working with, and also made things feel a bit too close to what I had already done with Maradaine Constabulary. The end result is much stronger, I think. We'll see if the agent agrees. There are pretty much two ways a sf/fantasy writer can go about writing and worldbuilding: come up with a story, and build a world for it to be in; or build a world, and come up with stories to put in it. One way to think of this is the difference between Star Wars and Star Trek. The Star Wars universe is really only about telling one story: the rise and fall of the Empire, and the concurrent fall and rise of the Jedi. I would argue that part of the problem with the Star Wars prequels is all they do-- all they really can do-- is set up the board for the story the universe has been built to tell. Star Trek, on the other hand built its universe out of telling many different stories, and has the ability to telling many, many different kinds of stories. Of course, with the Star Trek universe, you've got a lot of patchwork worldbuilding, held together by spackle, baling wire and wishful thinking. There's no right or wrong in this, mind you. Like plotting/pantsing, whichever method works best for your own particular style is the right way to go. However, both methods have their challenges. Personally, I'm a Method Two guy: I start with crafting and detailing the world, and the process of doing that opens up the avenues for stories. The challenge behind that is narrowing things down to figure out what, actually, you need to write in that world. With a whole wide world of grand and epic scope, you want to treat the whole thing like an enormous brood of children. No one gets neglected. So a world that has the potential for many, many stories might not yield any stories, because no singular story you write can be as grand and far-reaching as the worldbuilding work you've done. This was exactly my problem with my trunked project Crown of Druthal. It was nothing but a travelogue, going from place to place with no through-plot and little purpose. And why was that? Because I had made EVERYWHERE and therefore I had to go EVERYWHERE. It wasn't until after realizing the flaws with that mindset that I was able to narrow my focus to one city, and let the rest of the world only brush up to it, as the rest of the world would in a cosmopolitan city. I had a similar problem in the space opera setting for Banshee-- I had defined so much, I had to force myself to narrow the focus of what the story actually was going to be. So why not do it the other way, and build the world to suit your story? Of course you can, like I said, nothing wrong with that. The challenge there comes from when you need or want to do more beyond that story. I've mentioned this before with David Eddings. Everything in The Belgariad was set up to tell that story, as the ultimate, saving-the-world, fulfill-the-prophecy, make-everything-right story. And then a sequel series was asked for. So they had to undercut The Belgariad by essentially saying, "Yeah, that was the dress rehearsal. Here's the REAL event." Of course, building the world to fit the story you've come up with doesn't have to have this problem. Sometimes doing it that way can open all sorts of avenues to new stories that you hadn't imagined to begin with. So, when I talked earlier this week about the perils of overdescribing, of course some of the chatter I heard came back to worldbuilding. Specifically about walking that balance between taking all that wonderful, glorious worldbuilding work that you've done and therefore must share, and not boring the hell out of your reader with things that don't advance the story. If you've built a clock, most people have no interest in seeing how all the gears work. They just want to know what time it is. But if you haven't made the gears work properly, then the clock isn't going to tell you the right time. And that's what it boils down to: telling the reader what they're going to want to know in order to understand the story, not what you think they need to know in order to understand everything. I'm just about finished up (finally) with Way of the Shield, where I struggled with this balance, especially with the historical elements. Part of it involved having the main character go places where the discussion or examination of Druth history was a natural thing: attending a museum opening, or seeing a play that was the equivalent to Richard III. But I made sure to temper my desire to share EVERYTHING. Other news: Rayguns Over Texas is coming, of course, and Rick Klaw has been posting excerpts from each author's story over the past couple weeks. Here's the one for mine, Jump the Black. Enjoy! I recently discovered a little gem of satire: How David Weber Orders a Pizza. Go check it out. I'll wait. 120 meters later, he pressed the central pedal on his floorboard and the vehicle slowed smootly to a zero-zero intercept with the pavement. A signpost stuck out of the concrete outside, in front of and slightly to the right of his vehicle. It bore a large red octagon, with the word "STOP" emblazoned upon its center in white sans-serif lettering. The sign was a way of establishing right-of-way rules at this intersection of two streets. The vehicles going his direction, and going the opposite direction on the same street, would both see these "stop signs", and would thus be required by law to stop before proceeding. Vehicles following the street that crossed this one, on the other hand, would not see any "stop signs." They would be allowed to continue across the intersection without changing their velocity. If neither street had displayed any "stop signs", then vehicles following either street could legally cross the intersection at constant speed, resulting in disaster should two vehicles from each street be converging on the intersection at the same time. With the stop signs, the vehicles following the stop-signed street would be required to stop and wait for any such "cross traffic", thus ensuring that both they and the crossing vehicles would emerge from the intersection safely. While this is sublimely ridiculous, would a description or explanation of something in sci-fi or fantasy along these lines be that out of place? Weber is far from the only genre author guilty of this sort of thing. Now, part of this is the worldbuilding: the author has done the work, and it must be shared, right? But moderation is key. Does the reader NEED to know this? Does not knowing impede their understanding of what is going on? Sometimes a good infodump is entertaining and exciting-- Scott Lynch is good at this, for example, putting as much storytelling as possible into it. But more often than not, it's exactly like what this story satires: overcomplicated and absurd in chronicling the details that would be commonplace. Here's an exercise for you: modern life is pretty much the stuff of science fiction from 20 or 30 years ago. How would you accurately describe the commonplace of today in the voice of someone writing in 1993 or 1983? So, I will attending WorldCon in San Antonio at the end of the month, though I won't be appearing on any panels. Given the size and scope of this thing, I am absolutely fine with that. There will be a reading for Rayguns Over Texas on Saturday, followed by a signing for the anthology, and I intend to be on hand for that. But that's not anything official. I am happy-- thrilled-- to simply attend and drink up the atmosphere and see fellow writers and meet new people. A big part of that is due to the simple fact that most of the people in this industry are fantastic people, both the ones that I've met and become friends with, and the ones I've only had minimal interaction with. For example, a college friend of mine, who is in the process of medical school right now, also was accepted to Clarion West this past summer. He had applied to Clarion mostly as a hail-Mary, and was pleasantly surprised to be accepted. The problem, though, was he wasn't sure if he could swing both it and his academic duties. He contacted me, worried that if he had to turn it down, he'd be blackballed. This, apparently, was what he had experienced in medical school-- if you were accepted into a sub-internship, turning it down was career suicide. I was pretty sure it would be fine, of course the Clarion people knew that taking six weeks off from the other responsibilities of life was something few people could manage. But I wanted to confirm, and I asked around, asking writers who I knew had been involved in Clarion, even if my own interaction with them had been minimal. And every one responded quickly and courteously. And, of course, they all agreed: everyone involved in Clarion would understand perfectly. Here's another example. A few months ago, after I finished reading Boneshaker, I did a small amount of research on Cherie Priest, which made me realize that I had had an inside-baseball-business-of-writing question that she might have some insight on. So I emailed her with my random-yet-rather-specific question. In less than 24 hours, she not only responded, but with a long and well-considered answer. Did she have to do such a thing? Of course not, but she did, even though such a response would have easily taken a half an hour out of her day. Why? Because she's good people. I bet you every single one of those people have some story of someone who paid forward to them. And I have every intention to do the same. So, if you spot me at WorldCon, come say hello. Promise I won't bite. *- Not to mention, you know, accepting my story into the anthology. So, Some Books Are "Girl Books"? I don't get that. I work with children during the summer, and it's always fascinating to see the natural patterns of how children behave. Some things are very common amongst any group of children. For example, teams. Children can be obsessed with teams, in almost any activity where some level of competition comes into play. They want to make it absolutely clear who is on their team, or whose team they are on, and what the teams are. They will announce these points, multiple times. * And young kids will divide themselves into Boys and Girls, without any sort of prompting. Even despite prompting to the contrary. So if your goal is to convince a young boy that a certain book or story "is for girls" and he shouldn't try it, sadly, you won't have work very hard. However, I have absolutely no clue why you would ever have this goal. I mean, even as a kid, neither a female author nor a female protagonist would keep me from reading something. Perhaps this came from the fact that one of my bigger literary influences in my childhood was my older sister. She would read something and then pass it off to me. So that would include things like Are You There God? It's Me Margaret or the Flowers In The Attic and its many sequels. I don't think it ever occurred to me that I "shouldn't" read any of those things, and that carried through with me to this day. I can't imagine limiting what I would read based on such a thing. Are there really sci-fi fans who've skipped, say Xenogenesis or Parable of the Sower because Octavia Butler and her female protagonists might give them cooties? Same goes for movies or television. Two of the best new shows I saw in 2013 were Orphan Black and Orange is the New Black***, both shows dominated by female characters. I never once felt like these shows "weren't for me" or some nonsense like that. They were amazing work and I cannot imagine ignoring it because a women were at the center. So, I'm really, honestly curious: who out there is honestly not reading or watching something because of the gender of the author or the main character? And if so, why? *- Also: kids repeat themselves. A lot. **- I'm not immune. Heck, I love Julie Kenner's Demon Hunting Soccer Mom books-- not to mention Julie Kenner personally, as she is one of my heroes-- but I don't think I can get myself to read her Shadow Keeper books with covers that are all faceless, shirtless men. ***- I claim no credit for this, as I read it elsewhere, but if Orphan Is The New Black -- a show in which Tatiana Maslany plays every character in a women's prison -- was something that could exist, I would think it was the best show ever. After months of rumors and innuendo, Rayguns Over Texas, the new anthology of science fiction by Texas authors, will finally premiere in just 24 days on August 29 at LoneStarCon 3 (aka the 71st Annual World Science Fiction Convention) in San Antonio. Over at Rick Klaw's site, he'll be posting an excerpt a day from the anthology. Look at some of the names on that: Bruce Sterling! Michael Moorcock! Joe Lansdale! Aaron Allston! And many more. I'm ridiculously pleased to be on this. Go check it all out. It's been a bit since I've done one of my worldbuilding tour posts: now that the Hugos are voted on, it seems like a good time to return to it. Ch’omikTaa is a nation of warriors, but it is much more than that to them. Being a warrior is a noble calling, and an integral part of who they are. War is an art form, a religion, and a philosophy. The government of Ch’omikTaa is made of two Councils of Elders. The Council is made up of members from the four Ch'omikTaan provinces: Chachen, Relomik, Taanis and Ju'dun. 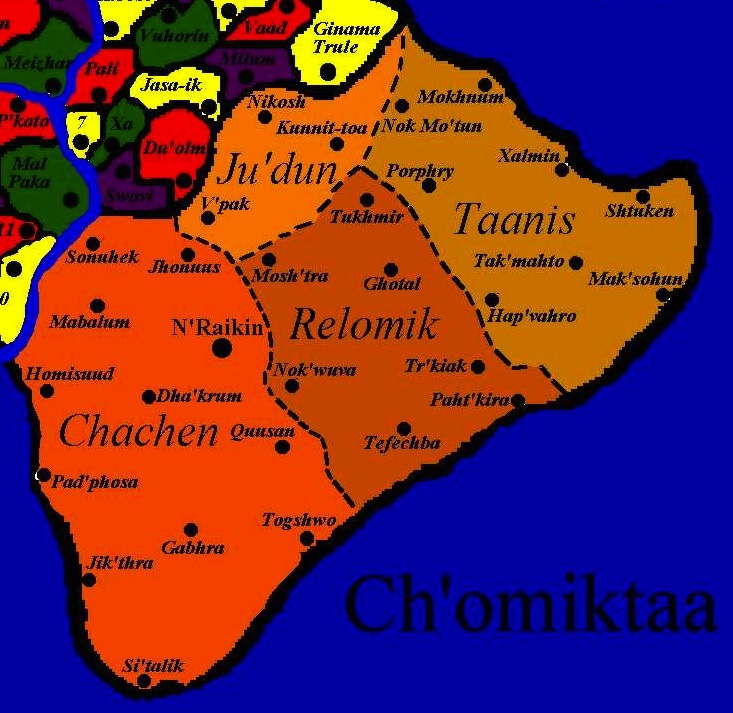 The first three are the main part of Ch’omikTaa, while Ju'dun is considered an occupied territory, as it consists of Jelidan lands and people that were annexed, conquered or allow to join Ch'omikTaan after its initial forming. It is given least consideration. The Senior Council has nine members , three each from the most prominent Houses from the main three provinces. The Junior Council has thirty-six members, from the remainder of the most powerful Houses in Ch'omikTaa. The Provinces are all broken into Houses, who control the land. A House’s influence in Ch'omikTaa depends on many factors: its land, its wealth, its militia's strength. The honor and martial skill of the Elder of a House is also important. Houses are further broken into Families, and Families have varying strength in a House, based on many of the same factors that make Houses strong. Both Families and Houses will vie for power and have their influence wax and wane, through battles, marriages, bondings, sales, Just Conquerings. Technically, all the Houses in Ch’omikTaa are allied, but at any given time, some House is doing battle with another. The function of the Council is not so much to govern, since each House is governed by its Elder. Rather, it is a forum for the Elders to discuss the impact of their actions to all of Ch’omikTaa and to defend the honor of their House if its actions are called into question. The Council also will take notice of and judge any warrior who has come to their attention, for good or ill. Most actual politics and decisions are made not by a vote, but with battle. All the laws in Ch’omikTaa center around their Warrior Code. Thus, an act in violation of this code, such as theft, or ambushing a defenseless enemy, is against the law. The Code is not specifically written down, but rather is based on hundreds of minute unspoken cultural mores, as interpreted by the sense of the Council. If Council members feel something is a dishonorable act, it is. Killing another is not dishonorable, but killing someone through use of poison is. The “Pillars of Dishonor” are a concept they use to help define a dishonorable act. The Pillars are Deceit, Sloth, Cowardice, Avarice and Treason. If someone’s actions are considered dishonorable, they will have to come before their House elder, or sometimes the whole Council, to answer for their actions. If they are still found dishonorable, the will lose rank, or in some cases, stripped of rank entirely. This will involve flaying and cutting their skin to remove the signs of rank and family from their body. Such a person is a pariah in Ch’omikTaan society, and usually leaves the country. The military in Ch’omikTaa is structured around the ranks of the culture. One of the most important aspects of being a Ch’omikTaan is rank. Rank is both social and military in nature, and is a measure of both the honor and respect you hold as a warrior. Children who have not begun The Rite of the Warrior, fieldworkers and laborers and women do not hold any rank. The first rank is Ta, which is given to those who start The Rite of the Warrior, usually done at an age of 8 to 10. Vassals and foremen on a commune (more on communes later) will usually hold this rank. Young boys of higher standing usually move through this rank quickly, though, as do those of great prowess in fighting skills. The second rank is Ra, which would be held by either the head of a commune, or a lesser member or functionary of a Family. The third rank is Cha, which indicates the higher members of a Family, or the functionaries or lesser members of a powerful Family. Kla, the fourth rank, is the head of a Family, and usually a Warrior of Distinction in the House. Kla also will serve as Special Warriors of the Council, either to protect council members, or to go on dangerous missions outside of Ch’omikTaa. Many Ch’omikTaan met in other parts of the world are Kla. Amra, the fifth rank, is either the head of a House, or a high member of an important House. The Council must grant the rank of Amra. All the Kla of the House will respond to the Amra's call. Demra, the sixth rank, is given to high members of council House, or the head of important (but non-council) House. A Council of Demra act as governors for each province. The final two ranks, Jham'ra and Kel'ra, are members of the Councils. Jham'ra are the Junior Council members, and Kel'ra are the senior members. One of the Kel'ra is the Council Lord, and all of Ch'omikTaa will fight at his word. It should be noted that in the Council Houses and Families, members hold higher ranks than standard. For example, in one of the Kel'ra Families, a family might be headed by a Demra or Amra, and a Commune could be headed by as high as a Kla. There is much more honor in serving a noble Family or House. Families are a very important thing to the Ch’omikTaa, but it is also used very broadly. Many people are part of the same Family, and yet are barely related to each other at all. Ch’omikTaan are very concerned about their ancestry, and know the line of their fathers back for several centuries. Loyalty in Ch’omikTaa is first to the Family, and then to the House. Ch’omikTaan homes are very simple and utilitarian, even for the most powerful of Ch’omikTaan. They are usually constructed from stone, made to withstand assault, with the only adornments being the symbols for that Family and House, which are found in every room and on the door. They also usually have very large and high rooms to them, so combat is possible within the room. Most homes have a large central room that functions as a training room, a meeting room and a ritual room, and this room is called the kadackh. It is the most important room in the house, and smaller homes consist of only a kadackh. Ch’omikTaan practice a form of ancestor worship. They believe that the spirits of those who have come before them watch over the world and give them strength. They are the culmination of all that their ancestors were and did, and that they represent the reason for their ancestors existing at all. Therefore, they believe that the actions of their ancestors reflect on them, and their actions reflect on their ancestors. Thus any form of dishonor in the family is regarded with much shame, and the stain of it lasts through centuries. Burial sites are very sacred to the Ch’omikTaa. Each Family will have a private burial site. Desecration of a burial site is not only one of the most dishonorable of acts, but it is also the greatest insult you can give to a Ch’omikTaan. Ch’omikTaan wear leather almost exclusively. They usually wear leather pants and boots and an open vest. Chests are usually kept bare, and arms always are. Arms are scarred and tattooed to show rank and family—left arm will show rank, and right will show family. They will further scar, pierce and tattoo their faces, ears and bodies, each one commemorating a great victory or event in their lives. Hair is usually allowed to grow long, and is braided tight. Ch’omikTaan are mostly meat eaters, but a large aspect of Ch’omikTaan cuisine is use peppers and other hot spices—the hotter and spicier, the better. Some have commented that eating a Ch’omikTaan meal is similar to fighting a battle in one’s mouth. The primary crop in Ch’omikTaa is the yam, which grows well in their climate. Also, a wide variety of peppers are grown in Ch’omikTaa. Ch’omikTaan will show great pride in their pepper crop. The Ch’omikTaan don’t vary what they eat per time of day very much. They usually eat twice a day, in the morning and at sunset. Most meals are a combination of meat, yams and peppers: Roasted meats stuffed with yams and peppers, roasted peppers stuffed with meat and yams, stews of meat, yams and peppers, and so on. They will drink fermented teas that are made with a variety of spices, peppers and flowers from the region.